Meticulously designed with ease-of-use and superior performance in mind, these Bingo Verification Machines feature the latest technology available. Weight: Console: 250 lbs. ; Flashboard: 175 lbs. 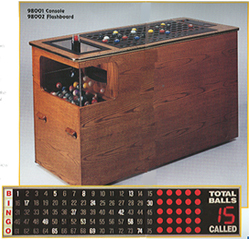 The Ultimate II Console has all the features of the Premier Console (see above), plus the machine displays the game pattern and "total balls called" count on the flashboard. 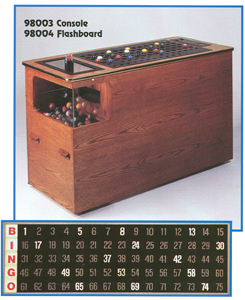 This Bingo Console also has a 10-year programmable memory. 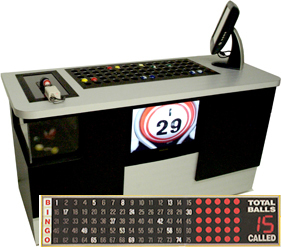 This memory feature allows seven different organizations to customize and store up to 64 patterns each (for a total of 448 patterns).The Bingo Machine measures 55" long by 24" wide by 33.5" high. 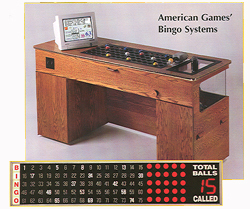 For additional information on any of our Bingo Consoles and Flashboards, including American Games Bingo Consoles, Desks, and Blowers, please contact us at 1-800-233-0828. Feel free to browse our Bingo Paper and Bingo Daubers, and Bingo Games - U-Pick-Em Bingo, Bulls Eye Bingo, and Push Out Bingo Cards.